WASHINGTON — In his speech at the White House on Wednesday, the Roman Catholic pontiff known as Francis called for a “tolerant and inclusive society” while simultaneously asking for respect for religious liberty and efforts to address global warming. “Mr. President, together with their fellow citizens, American Catholics are committed to building a society which is truly tolerant and inclusive, to safeguarding the rights of individuals and communities, and to rejecting every form of unjust discrimination,” he said before a gathering of approximately 11,000 attendees, which applauded his statement. 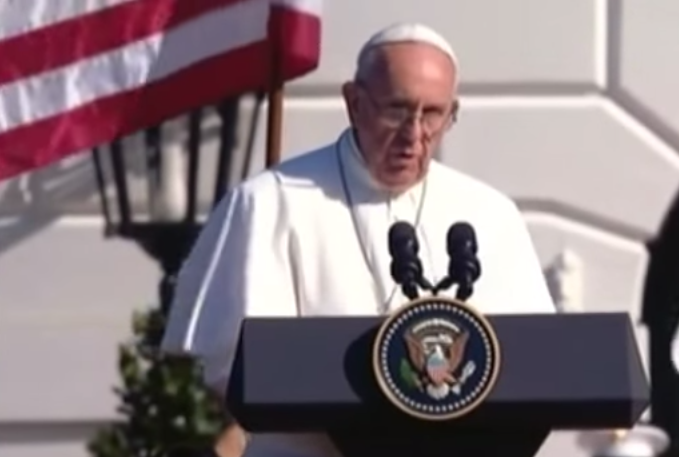 During his brief speech, the pontiff asked Barack Obama to do more to combat global warming. “I would like all men and women of good will in this great nation to support the efforts of the international community to protect the vulnerable in our world and to stimulate integral and inclusive models of development so that our brothers and sisters everywhere may know the blessings of peace and prosperity which God wills for all his children,” Francis stated. The speech was part of the pontiff’s six-day visit to the United States, which will include stops in Philadelphia and New York City. He is expected to address Congress during his visit as well, but some lawmakers, including those of the Roman Catholic faith, are vowing to boycott his appearance because of his plans to speak on climate change. Rep. Paul Gosar announced his decision to skip the event on his public Facebook page last Thursday. “I have made the difficult decision to boycott the Pope’s address to Congress … after numerous media outlets reported His Holiness would be spending much of his address supporting climate change policies instead of using this opportunity to advocate for religious tolerance and the sanctity of life,” he wrote. “As an elected Representative, and as a practicing Catholic, I have both a moral obligation and leadership responsibility to call out leaders, regardless of their titles, who ignore the ongoing Christian persecution in the Middle East as well as the abortion epidemic in the United States,” Gosar said.